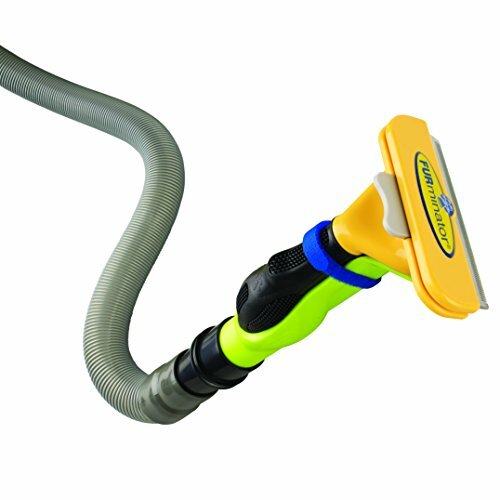 You can add vacuum power to all FURminator deShedding Tools: This vacuum accessory is compatible with current small, medium and large size FURminator deShedding Tools for dogs or cats. Use short, firm strokes to remove your pet’s loose undercoat. After the edge has accumulated some loose hair, press the FURejector button on the deShedding Tool and watch the hair disappear! Shedding is natural; there’s no way to eliminate it. But you can eliminate the frustration associated with it. Use FURminator pet products for professional-quality, at-home grooming results: Brush daily to detangle and smooth fur; deShed weekly to reduce shed hair; and bathe monthly to promote healthy skin and coat while reducing shedding.